As usual, we counted bikes on Lothian Road and Forrest Road, on the second Tuesday in May, during rush hour. 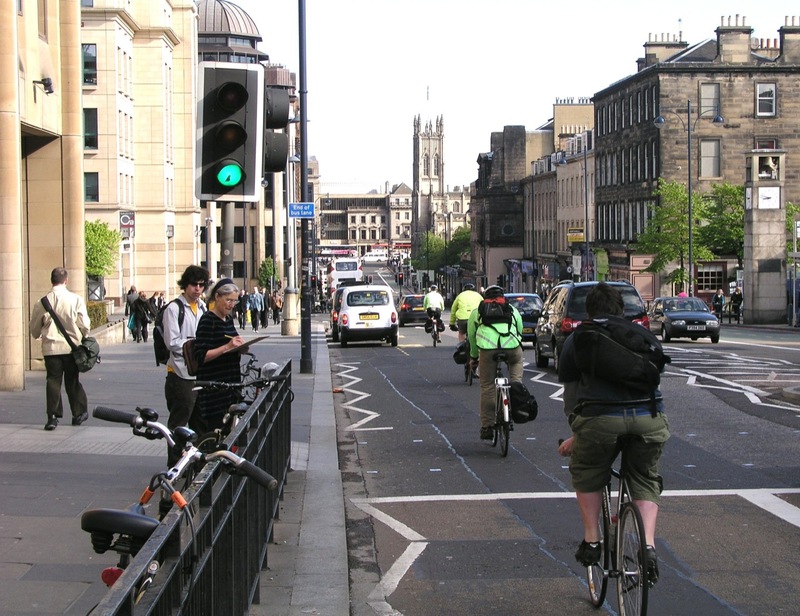 21.2% of citybound Lothian Road vehicles were bikes, and 24.3% in Forrest Road. Comparisons with past counts are difficult in that the last count was in November, whilst in the previous May count  the tram works were still causing traffic re-routing. However, whichever comparison is made, total bikes are up and total cars are down. Overall there is little change in the number of commercial vehicles [our count lumps together buses, taxis, vans and lorries]. See the full count data and trends from 2006 to the present on our traffic counts page. Forrest Road saw the biggest rise in cycling, and the biggest fall in private motor traffic, both northbound and southbound. Could the cycling increase partly reflect excitement over the new public bike counter? Lothian Road was a mixed picture. Northbound again bikes were up and cars down, though not by huge amounts. It is in any case astonishing that 21% of citybound rush-hour vehicles on Lothian Road are now bikes. Even the tramline crossing at Princes Street has not prevented a small rise in bikes. Southbound, however, bikes were down [see * below] and cars substantially up. Once again 7 out of every 10 cars have only one occupant – a huge waste of precious roadspace. In the citybound direction, heading for the heart of congestion, and also responsible for creating it, a shocking 77% of cars are single occupant. The 2011 Edinburgh census data confirms this picture, and additionally shows that many of the multi-occupant cars are on the school run. Therefore single-occupancy commuting is almost certainly significantly worse than our 77% figure. With the tram works now well past we can also better compare the present situation with our first ever May count, in 2007. Since then the total cycle count has risen by 34% whilst private motor vehicles have fallen by 12%. This pattern – cycling up significantly and car commuting down – confirms the trends in the 2011 census and our subsequent 2012-2014 data suggests the trends are continuing. So Council policies are working – albeit too slowly. A step change is needed now. Next time you write to your councillors you can congratulate them that the trends are in the right direction – then point out how they can move faster to build on their successes. What next for the Forrest Road Triangle corridor? Back in 2006/2007 before the tram works affected traffic the 8-9am rush hour saw roughly 500 cars in each direction along this corridor. Now our counts show that we are down to roughly 400 cars northbound and just 300 southbound, whilst cycle use has risen 50% in both directions. The continuing rise in cycling and the falling car traffic, both northbound and southbound along George IV Bridge and the Forrest Road triangle, make a strong case for a bold initiative by the Council to make the entire area more cycle and pedestrian friendly, reducing substantially the dominance of the car. Spokes will be putting forward a plan to do this in our Summer Bulletin. Why was there a significant fall in southbound cyclists at Lothian Road when there were rises at all 3 other count points? Possibly some southbound cyclists have changed to the Forrest Road corridor, where southbound cyclists rose significantly. I was counting bikes south-bound on Lothian Rd for the 0830-0915 slot and the drop in bike volume was quite apparent, especially as there always seemed to be flocks of bike heading North. My speculation is that South-bound cyclists on the Queensferry Rd/Hope Street – Lothian Road axis may be seeking to avoid the main West End junction, because it is much more awkward for cyclists southbound, than it is northbound. Southbound, it is virtually impossible to ride through and the walk is quite long, whereas northbound it is possible to ride through (albeit using the dropped kerb and railings gap provision. Of course, we also need to explain why cars were up southbound at Lothian Road, whereas they were down at all 3 other count points. Could there have been a transfer of southbound cars from the Forrest Road corridor to Lothian Road?